The November 8 elections were a huge victory for freedom, and it had nothing to do with presidential candidates. Seven states voted to legalize the recreational or medicinal use of cannabis, bringing the total number of U.S. states with some form of legal weed to 36. Arizona, where pharmaceutical companies donated heavily to anti-cannabis efforts, was the only state that rejected legalization. One facet of the anti-cannabis propaganda campaign was the claim that roadways will become more dangerous as “drugged driving” becomes more prevalent. However, just as the ‘teen pot use will increase’ claim has been debunked, the ‘dangerous roadways’ myth is also unraveling. 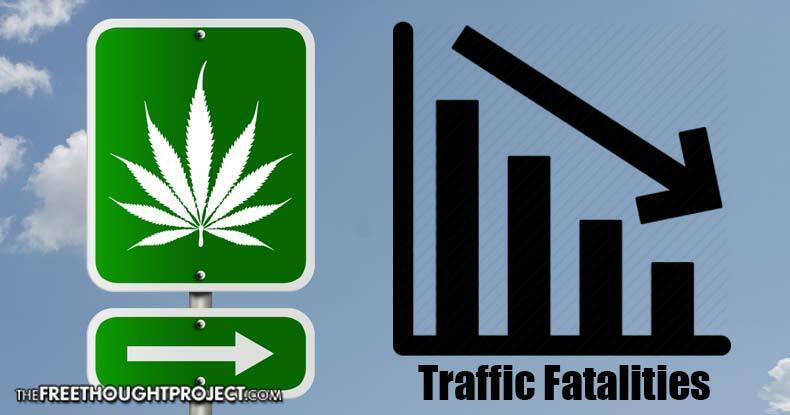 A study published by the American Public Health Association found that states with legal medical cannabis have lower rates of traffic fatalities than states with full prohibition. The researchers analyzed 29 years of data in the Fatality Analysis Reporting System. Silvia Martins, the study’s lead author, theorized that part of the reason for this phenomenon may be people substituting cannabis for alcohol. As we know, drunk driving is far more dangerous than stoned driving. In fact, as we reported in September 2015, a first-of-its-kind study found virtually no driving impairment under the influence of cannabis. Some increased weaving and slower reaction times have been observed, but studies have also found that stoned drivers reduced speeds and increased following distances. The new study adds to a finding in 2015 that cannabis use does not increase the risk of car crashes. Propagandists such as Kevin Sabet of the so-called “Smart Approaches to Marijuana” should drop their disinformation efforts in the face of actual data. But that’s not likely to happen. Instead, we should focus on the benefits of cannabis legalization, number one being that people regain the freedom to ingest a plant. Government has no place dictating what people can and cannot do with their own bodies. Thousands of epileptic children across the country are experiencing dramatic improvements in their quality of life – reducing or even eliminating seizures – through access to medical cannabis products. Countless others patients are successfully treating a variety of illnesses such as Crohn’s disease, cancer, glaucoma and a host of others. Some people are able to drop their dangerous prescription painkillers as they discover cannabis plays a beneficial role in pain management. This has the potential to counter the opioid epidemic currently gripping the nation. And let’s not forget the economic benefits of cannabis legalization. A recent analysis found that the Colorado cannabis industry is contributing more to that state’s economy than all other industries. Thousands of jobs are being created and billions in revenue is being generated. As legalization progresses and more data come in, it’s only a matter of time before the anti-cannabis propaganda machine is destroyed in its entirety.